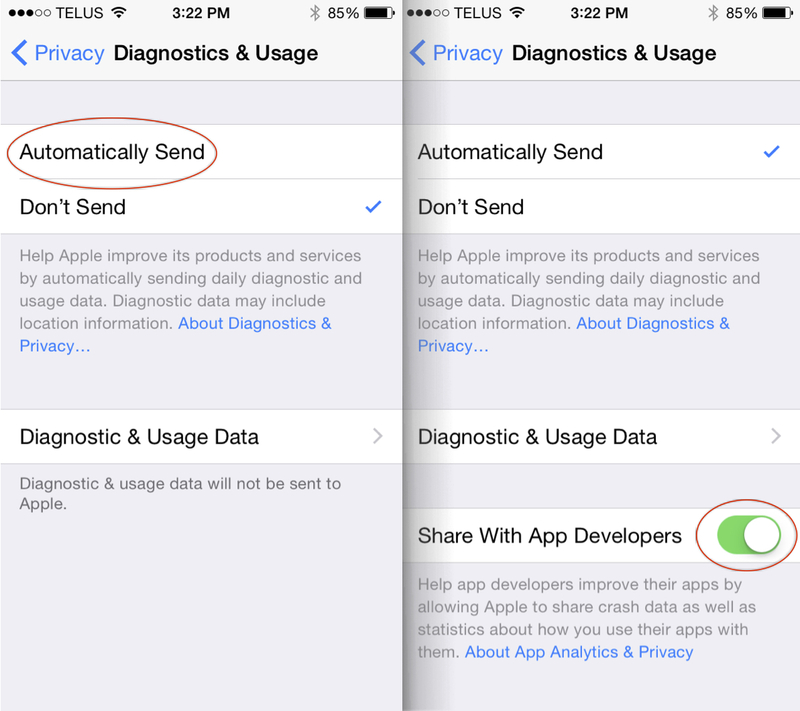 Introduced in iOS 8, iPhone users are asked to automatically share diagnostic and usage data with app developers. This new privacy permission is an extension of Apple’s other Diagnostic & Usage Data permission, which automatically sends daily app analytics on performance statistics, device usage, and other information directly to Apple. iOS 8 took things a bit further by asking users to consent to Apple sharing crash data and other app analytics with developers. Apple collects all this data to improve their products, and now it looks like they’ve decided to share the wealth. Hands down, this was the biggest change in iOS on the developer side of things. While the data being shared isn’t Snowden-worthy, this new permission still allows Apple to share information to people outside of their walls. And since data collection and privacy permissions tend to make people nervous, we wanted to parse out what this means for all us iPhone users. The most important thing to keep in mind is that Apple will only share very general statistics about how users interact with an app to that app’s developer. This means no personal information. Instead, developers will see how many people visited their App Store page, how many users downloaded their app, how many remained active over time, and if any of this resulted because of their app marketing efforts. The focus here is on how an app performs in the App Store — so there’s nothing about your highest score on Candy Crush (or how hard you had to work to get there). Once you realize how limited the collected data is, you might be wondering why so many developers have been trumpeting its praises since Apple announced these changes in June. It all makes sense once you consider how little developers were working with before. iTunes Connect, Apple’s developer dashboard, previously only provided a portal to submit an app to the App Store, collect payments, and track some basic app analytics like total downloads. This was frustrating, especially considering the Google Play Developer Console features robust analytics, including human-contracted translation so developers can target native languages to specific regions. Basically, app developers are excited because, behind all the glitz and glam of the App Store, the dashboard that helps them manage their apps used to have all the power of a tomato. That didn’t really cut it when they were trying to figure out how to attract users — or worse, if you paid a marketer a bunch of money to attract users and your number of app downloads barely changes. More information on how users are interacting with their apps in the App Store can help developers optimize things like app preview photos or even the words they use to entice a user to download. While Apple asks you during set-up if you’d like to automatically share diagnostics and usage data, you always have the power to turn these permissions off and on. To see what information you’re sharing, head to Settings > Privacy > Diagnostics & Usage. If you’ve selected “Automatically Send”, only then can you opt-in to “Share With App Developers”. Is the iPhone 5 Still Good in 2019? Orchard buys quality pre-owned devices and sells them all over Canada to quality human beings, like you. In this mission, we have touched, tested, and sold thousands of iPhones and amassed a wealth of knowledge along the way. Read these insights, from the people who know used phones best.